Snip.it is designed to help people share their thoughts and ideas about items they find on the Web, as well as discover others who have similar interests. What: Snip.it is designed to help people share their thoughts and ideas about items they find on the Web, as well as discover others who have similar interests. Though much like Pinterest in concept, Snip.it was developed to encourage sharing of content as opposed to images, explains founder and CEO Ramy Adeeb. "It's not just about the content," he adds, "but what you have to say about that particular bit of content." How: While browsing the Internet, users can add to their collections by clicking the Snip.it button, or by typing "snip.it/" in front of a URL and then loading the page. Either of these methods will result in a saved "snip" that can be either shared or kept private. With each snip, users can add their thoughts before the snip is added to the collection. Each snip is saved in a category such as travel, technology, or social issues. Additionally, when reading a story someone else has shared, users can look at a carousel running at the top of their screen that directs them to other snips by that user. Why: Frustrated with the lack of permanence of posts on platforms such as Facebook and Twitter, Adeeb saw a need for a site that allowed users to both save and share content with friends, strangers, or for their own personal use, while also providing commentary on the topic at hand. "I was looking to create something that interweaves bookmarking with blogging," he explains. 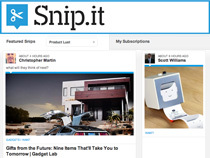 Who: Snip.it is an effective tool for any brand, company, or person who wants to share content on the Web. Adeeb says Snip.it's goal is to have broad reach, "whether you're very intellectual or want to read gossip news."